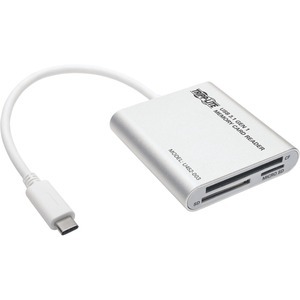 If your tablet, laptop, Ultrabook, Chromebook or computer doesn't have a built-in memory card reader, but does have a USB Type-C port, the U452-003 USB 3.1 Gen 1 Multi-Drive Smart-Card Flash-Memory Media Reader/Writer can easily transfer data between your device and a wide variety of memory cards. Photo libraries, documents, high-definition audio and video, and other large files transfer at USB 3.1 Gen 1 speeds up to 5 Gbps. Backward compatible with previous USB generations, so data can still transfer regardless of your device. The compact aluminum case with built-in 3-foot USB-C cable fits easily into your pocket, backpack, briefcase or laptop bag so you can read and write files at a moment's notice. No drivers or external power supply needed.